Facebook Agrees to Settlement with FTC – But will Anything Change? Perhaps that is true. After all, it was the predecessor site – Facemash – that resulted in accusations of “breaching security, violating copyrights and violating individual privacy by creating the website.” Zuckerberg decided to get out of the social media arena. “Issues about violating people’s privacy don’t seem to be surmountable,” he wrote at that point. “I’m not willing to risk insulting anyone.” But that did not last long. Shortly thereafter, Facebook was born. Moreover, the EU is not finished with this issue. It has come under fire from states such as Ireland and Austria as well as the broader European Union. According to news reports, in January 2012, a new EU directive will be proposed to “ban targeted ads to users unless the user specifically allows it. If this new legislation is passed it would mean that every time Facebook doesn’t comply it would face substantial fines as well as serious legal action.” The potential EU action will go much further than the FTC. Zuckerberg has elevated two Facebook attorneys to be responsible for privacy enforcement. Time will tell, however, whether the promotions will change the culture of a company that has a leader who sheds only crocodile tears over privacy violations. A thirty day public comment period for the existing FTC consent decree has begun. The public will have an opportunity to address the scope of the FTC response, which is substantially less than the EU proposals. Which is the better approach? Speak up. Interested parties can submit comments online or in paper form by following the instructions in the “Invitation To Comment” part of the “Supplementary Information” section. Comments in paper form should be mailed or delivered to: Federal Trade Commission, Office of the Secretary, Room H-113 (Annex D), 600 Pennsylvania Avenue, N.W., Washington, DC 20580. Three decades ago novelist Salman Rushdie became an internationally famous author after his novel, The Satanic Verses, led to a decade in hiding, fearful of the Haraam (death penalty fatwa) pronounced on him by Iran’s spiritual leader because Iran’s leadership believed the book to insult Mohammed and the Qur’an. After such a battle, Facebook was a minor opponent, though perhaps equally insulting, given our interconnected lives. Facebook requires a poster to use one’s real identity unless Facebook agrees to the contrary. (It has done so, for example, to allow for animated characters to have pages as part of marketing campaigns.) 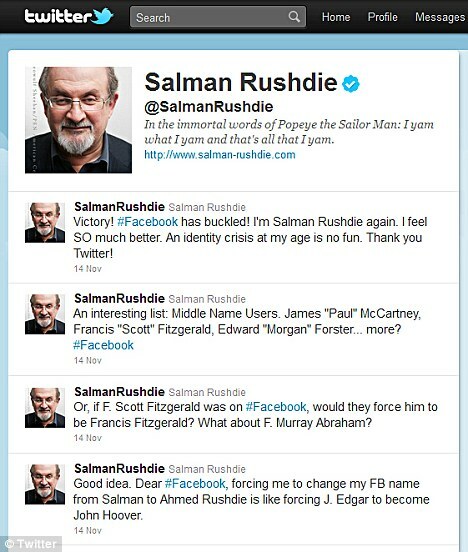 So Facebook insisted that Rushdie use the name in his passport – Ahmed – rather than his middle name Salman, which he has used throughout his professional career. Worse, the page automatically made the switch. Facebook values accountability, but that value is at odds with anonymity and pseudonymnity, both important for political and social speech. Who better than Rushdie for someone to stand for the cost of writing controversial content. Rushdie and his thousands of followers have forced Facebook to relent, but the issue of what constitutes “real identity” is probably going to only grow as the public realizes that often a person’s real identity is not the one on the birth certificate. This Friday and Saturday, Georgetown University will be hosting the Quello Center’s Governance of Social Media Workshop. A large group of academics, policymakers, representatives from the advocacy community and industry (including Facebook and Google) will be debating the various policy issues raised by social media. This Friday and Saturday, watch the live webcast of the Governance of Social Media Workshop. To learn more, visit the conference website. or follow on Twitter at hashtag #GSMworkshop. For a large and growing portion of the population, social media of various types have become an integral part of daily life, and businesses based on social media have become a major economic force. Given their pervasive influence on institutions and society, it is time to start developing a more comprehensive framework to guide policy responses to the challenges raised by social media, which to this point have been addressed piecemeal as they become salient. I am honored to have been invited to be a participant among such an impressive group of speakers. My small contribution will be available following the conference on SSRN.